(Nanowerk News) Bring the drugs, hold the suds. That summarizes a promising new drug-making technique designed to reduce serious allergic reactions and other side effects from anti-cancer medicine, testosterone and other drugs that are administered with a needle. Developed by University at Buffalo researchers, the breakthrough removes potentially harmful additives -- primarily soapy substances known as surfactants -- from common injectable drugs. "We're excited because this process can be scaled up, which could make existing injectable drugs safer and more effective for millions of people suffering from serious diseases and ailments," says Jonathan F. Lovell, a biomedical engineer at UB and the study's corresponding author. The work will be described in a study that will be published on May 19, 2016 in the journal Nature Communications (""Therapeutic Surfactant-Stripped Frozen Micelles"). The paper and all information in this press release are embargoed until May 19, 2016 at 5 a.m. U.S. Eastern Daylight Time. Pharmaceutical companies use surfactants to dissolve medicine into a liquid solution, a process that makes medicine suitable for injection. While effective, the process is seldom efficient. Solutions loaded with surfactant and other nonessential ingredients can carry the risk of causing anaphylactic shock, blood clotting, hemolysis and other side effects. Researchers have tried to address this problem in two ways, each with varying degrees of success. 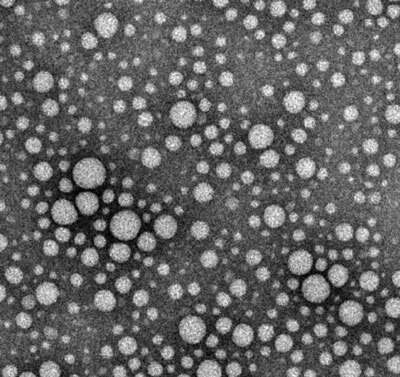 Some have taken the so-called "top down" approach, in which they shrink drug particles to nanoscale sizes to eliminate excess additives. While promising, the method doesn't work well in injectable medicine because the drug particles are still too large to safely inject. Other researchers work from the "bottom up" using nanotechnology to build new drugs from scratch. This may yield tremendous results; however, developing new drug formulations takes years, and drugs are coupled with new additives that create new side effects. The technique under development at UB differs because it improves existing injectable drug-making methods by taking the unusual step of stripping away all of the excess surfactant. In laboratory experiments, researchers dissolved 12 drugs -- cabazitaxel (anti-cancer), testosterone, cyclosporine (an immunosuppressant used during organ transplants) and others -- one at a time into a surfactant called Pluronic. Then, by lowering the solution's temperature to 4 degrees Celsius (most drugs are made at room temperature), they were able to remove the excess Pluronic via a membrane. The end result are drugs that contain 100 to 1,000 times less excess additives. "For the drugs we looked at, this is as close as anyone has gotten to introducing pure, injectable medicine into the body," says Lovell, PhD, assistant professor in the Department of Biomedical Engineering in UB's School of Engineering and Applied Sciences. "Essentially, it's a new way to package drugs." The findings are significant, he says, because they show that many injectable drug formulations may be improved through an easy-to-adopt process. Future experiments are planned to further refine the method, he says.